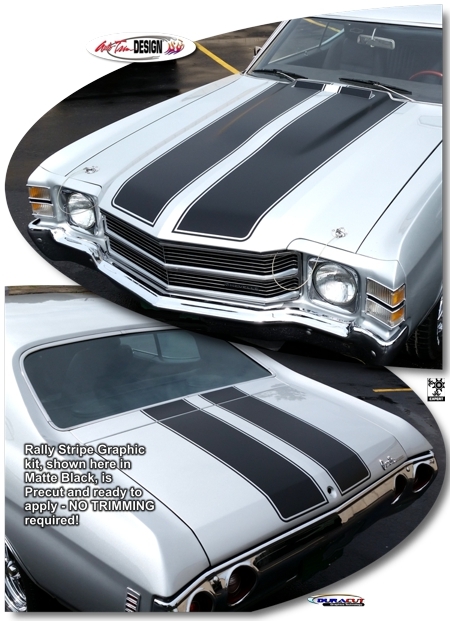 Classic Rally Stripe Graphic kit will make your '70-'72 Chevrolet Chevelle "Tough-looking" with this Rally Stripe hood, roof and rear gate graphic kit. Kit is packaged as precut pieces with a classic 0.30" (7.62mm) pinstripe at the outside perimeter as shown. NO TRIMMING required! Kit is specifically made for the '70-'72 Chevrolet Chevelle factory Cowl Induction style hood and rear lid areas and will not fit any other vehicle. Rally stripes are set for center spacing as per the Parts List at time of installation. Professional assistance may be required due to multi-contoured nature of the Cowl Induction Style Hood.